In honor of Veteran’s day, the Wyoming State Archives will be closed tomorrow, November 11th. A big thank you to all past and present service members for your sacrifice. 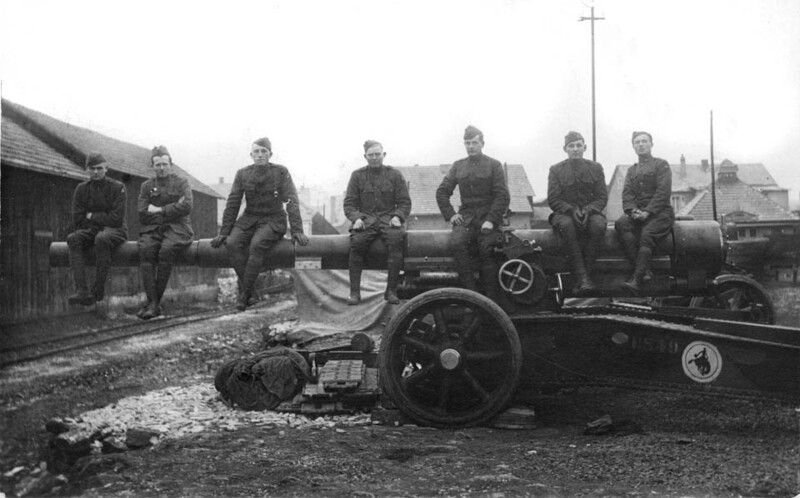 “C Battery Boys at Hohr, Germany”, 1917-1919. Note the bucking horse stencil that designated the Wyoming troops’ unit. Today is the birthday of former governor, US Senator and World War I veteran Frank Barrett. Happy Birthday to Wyoming Governor and Senator Frank Barrett! Frank A. Barrett was born in Omaha, Nebraska on November 10, 1892. He resided in Omaha during the early years of his life, graduating from hometown Creighton University in 1913 and from Creighton’s law school in 1916. Examples of Senator Barrett’s middle and university school records. 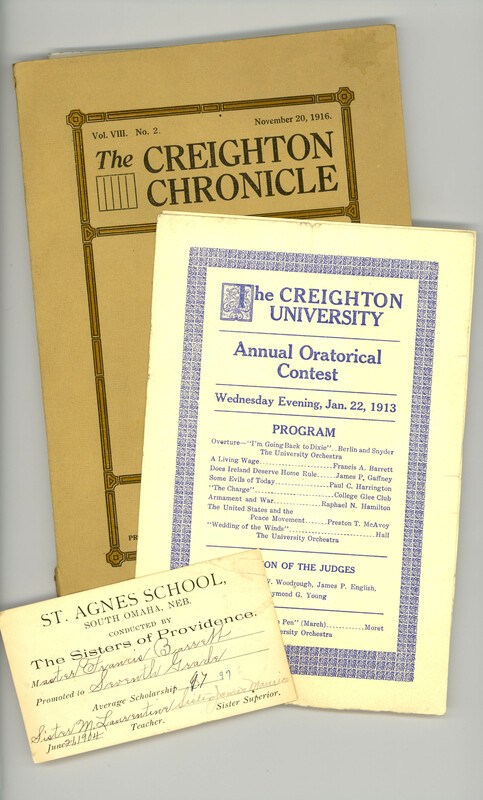 He presented the speech “A Usable Wage” in Chreighton’s 1913 annual oratorical contest. During World War I he served as a Sergeant in the U.S. Army’s Balloon Corps. After the war he married his childhood sweetheart, Alice Donoghue, in 1919. They were married by Father Edward Flanagan, founder of Boys’ Town. Shortly thereafter the young couple moved to Lusk, Wyoming where Frank set up shop as an attorney. After college, Barrett married his childhood sweetheart, Alice. Governor Barrett seated at his desk in the Capitol Building, 1951. 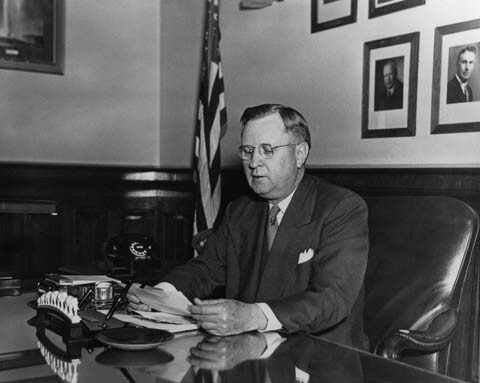 Barrett only served two years as Governor of Wyoming, winning election to the U.S. Senate in 1952. He was Senator for six years, but failed in re-election efforts in 1958 and 1960. Senator Barrett died on May 30, 1962. 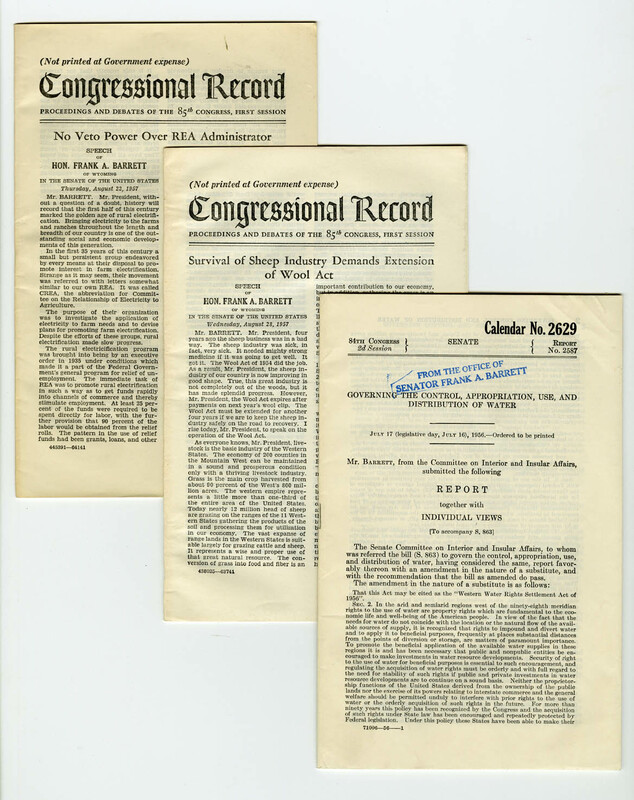 Three opinions and reports given by Barrett during his time as US Senator. The records of Governor Barrett maintained by the Wyoming State Archives consist of subject files maintained by his staff. Through correspondence, reports and meeting minutes, the files document interaction with state officials and agencies, and cover issues of concern to the state at that time. Senator Barrett attaching the bucking horse name plate made by Mrs Opal Templeton of Lusk to his office door. Personal papers and political records of Senator Barrett are also held by the State Archives. These are cataloged as collection H97-33. Much of the collection deals with Senator Barrett’s political career and concurrent events. 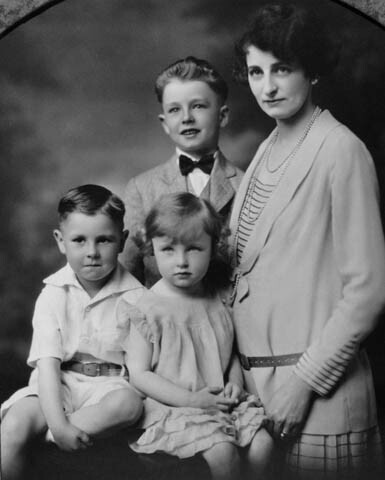 However, the collection also documents the activities and accomplishments of the family from Senator Barrett’s youth to the careers of his children, Frank A. Barrett, a surgeon; James Emmett Barrett, a federal judge; and Marialyce Tobin, an attorney. This child’s speech textbook was given to Barrett in 1901, according to the inscription. It is a “practical manual of delsarte exercises and elocution” complete with diagrams of gestures. Perhaps this book helped the young Barrett to develop the skills that served him so well as both a lawyer and a politician. 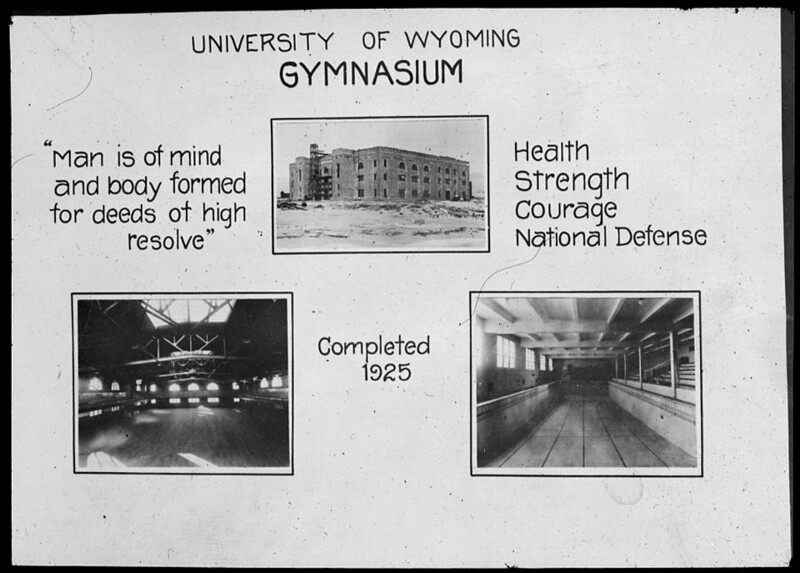 These collections document the lives of one of Wyoming’s most influential families, and events and issues which impacted the state during the mid-years of the 20th century. 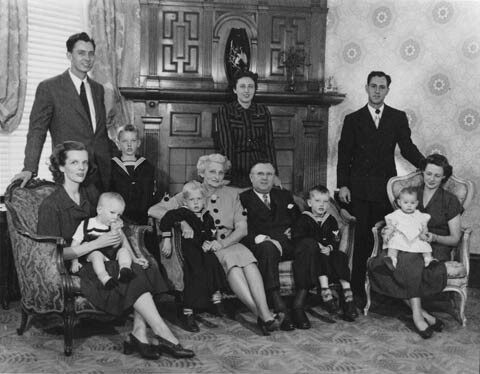 Governor and his family at the Governor’s Mansion in Cheyenne, 1951. The Sweet Sound of… Saxophones! Today is national saxophone day! Why November 6th? Because that is the birthday of Adolphe Sax, the Belgian inventor of the saxophone. And today happens to be his 200th birthday. Incidentally, today is also the 160th birthday of John Phillip Sousa, legendary march composer and promoter of saxophone use in bands. In honor of both of these men, we bring you the O.P. Thayer Saxophone Band of Rock Springs! The O.P. Thayer Saxophone Band shows off their new maroon uniforms in front of the Rock Springs City Hall, ca 1902. 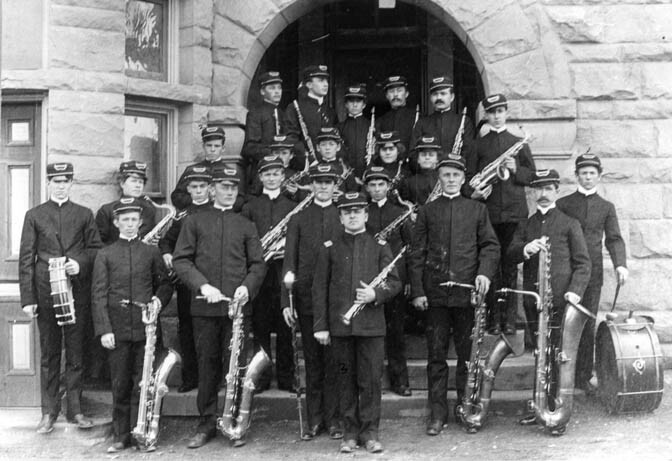 The large instrument in the front row, far right is the first bass saxophone manufactured by the Conn musical instrument company. Born in Massachusetts around 1875, Oliver “Ollie” Pearson Thayer, moved with his family to Rock Springs around 1877. In high school, he played in the band and orchestra, often with his sister Mary. For a while in his late teens-early twenties, Thayer dabbled in professional photography but found his calling in music. Around 1902, he organized his saxophone band, possibly the first of its kind in the nation. The group often serenaded the residents of Rock Springs at concerts, dances, community events, commencements, weddings, for visiting dignitaries and even at a few funerals. The band received rave reviews from local and national press. 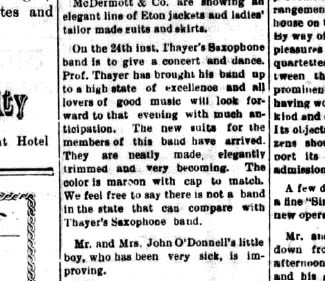 Thayer’s band also received the first bass saxophone produced by the Conn company, a leading instrument manufacturer. By the 1910s, saxophone bands had sprung up all around the country. 1903 seems to have been the height of the band’s popularity, though they continued to perform until about 1905. 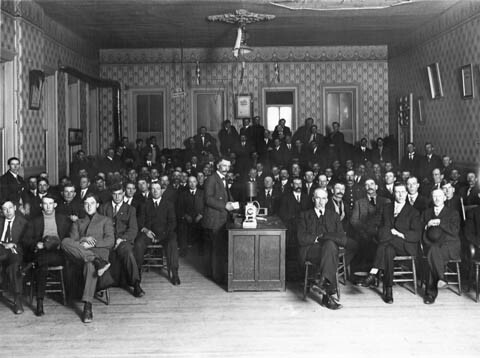 During the summer of 1903, the band traveled to Fort Washakie, Lander and Atlantic City and entertained President Theodore Roosevelt during his visit to Evanston that year as part of a three day trip through Wyoming on his way back from the West Coast. In addition to leading various bands and orchestras in the Rock Springs area, Thayer also composed several pieces of music. O.P. 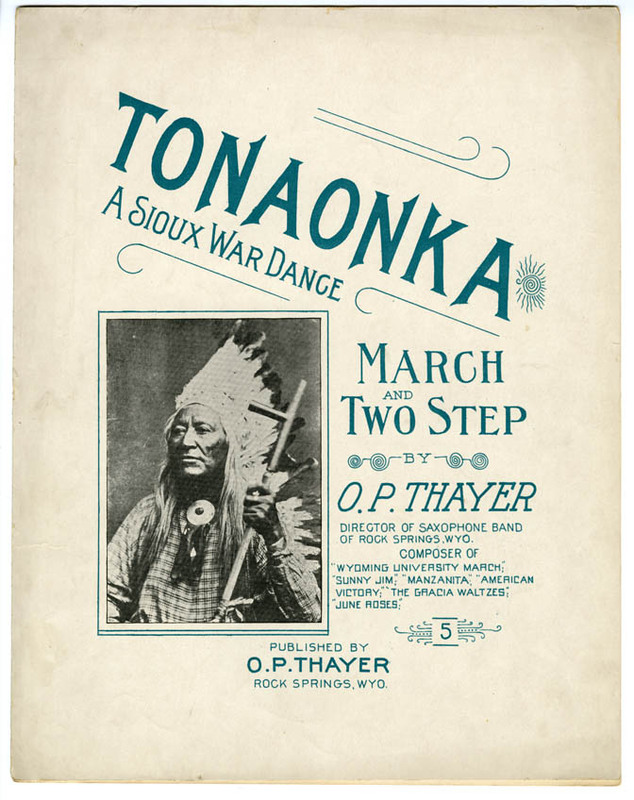 Thayer composed several pieces of music including this 1906 piece punctuated by “Indian yells.” Unfortunately, he used a photo of Shoshone chief Washakie to illustrate his “Sioux” war dance. Most of his compositions seem to have been marches and/or two steps. 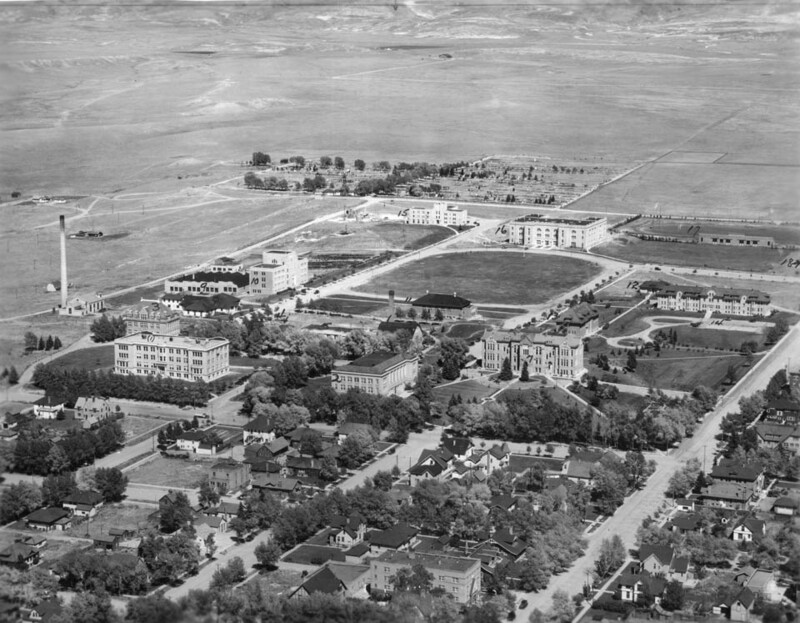 Thayer and his family moved to Havre, Montana in 1914 but kept in contact with their family and many of their friends in Rock Springs. By 1932, he and his family had moved to Redlands, California where he directed the school band and orchestra. 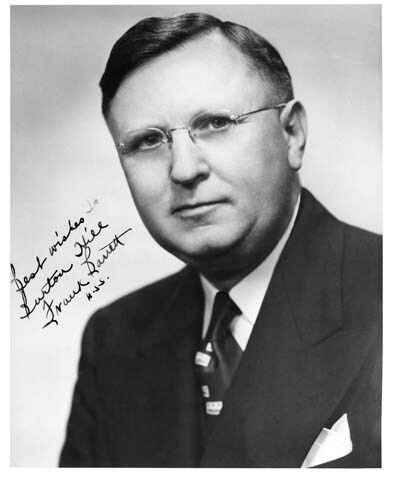 Thayer died in California in 1957. 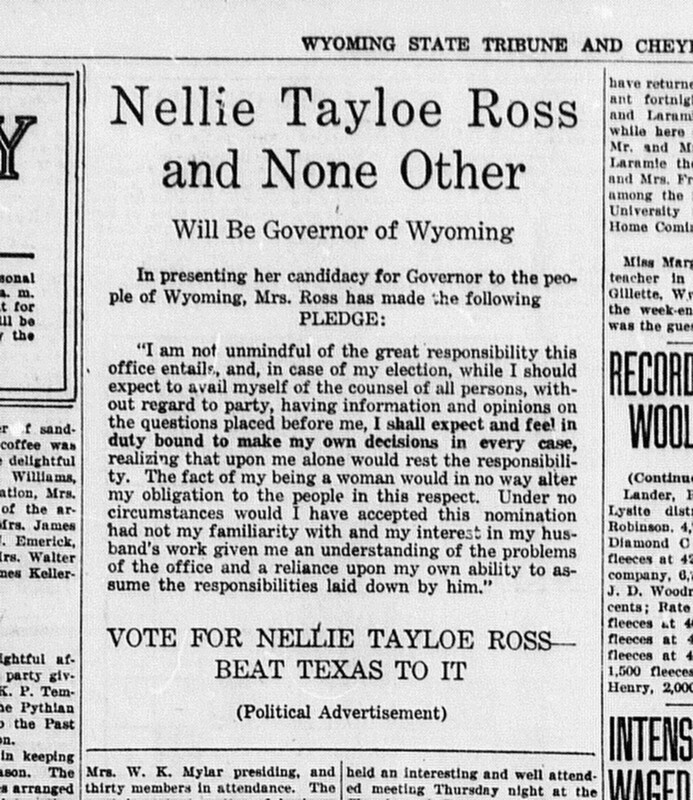 On November 5, 1924, Wyoming made history by electing Nellie Tayloe Ross governor, once again shattering a glass ceiling for women. The state that led the way in women’s suffrage became one of two that year to elect a female chief executive. 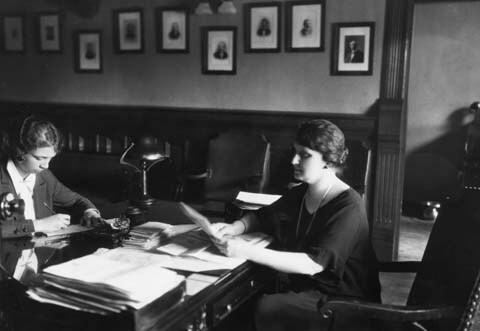 Governor Nellie Tayloe Ross seated at her desk in the Governor’s Office, Wyoming State Capitol Building, 1924-1926. Ross was the first female governor in the United States. She and Ma Ferguson of Texas were both elected on November 5, 1924, but Ross took office before Ferguson. Just over a month before, Nellie had been just another first lady, albeit a very involved one. 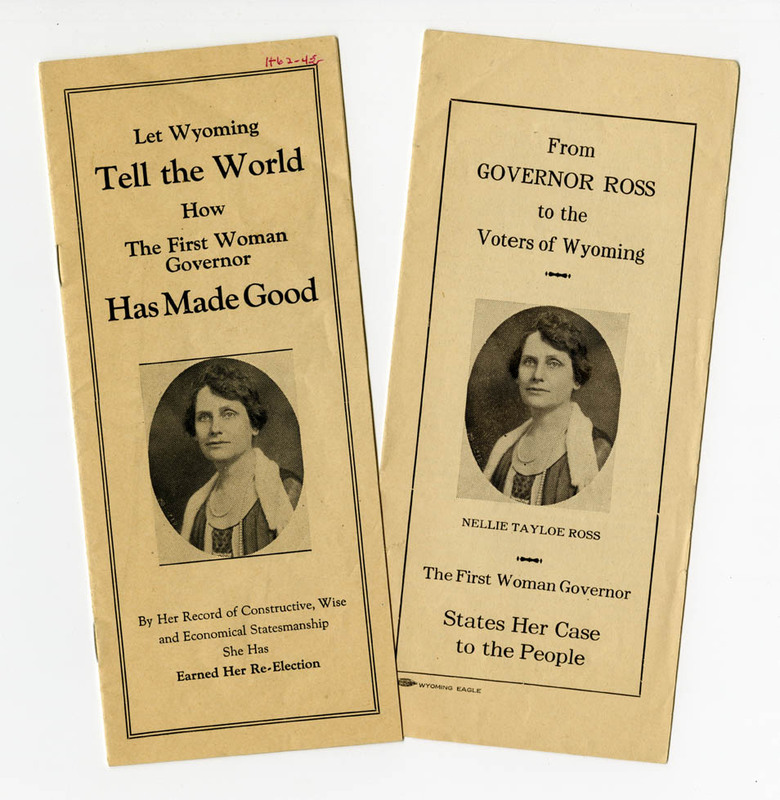 Her husband, Governor William B. Ross, had bucked the Republican stronghold on Wyoming politics and was elected Governor in 1924, despite a lack of support from Senator John B. Kendrick of Sheridan, Wyoming’s Democratic powerhouse. Nellie was her husbands constant helper, companion and confidant, even writing and refining speeches for him. 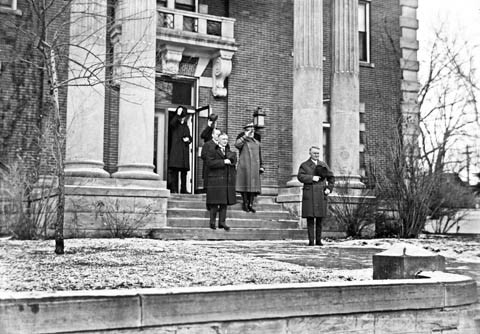 Governor William B. Ross standing on the steps of the Governor’s Mansion following his inauguration. His wife, Nellie, was offered the Democratic nomination for governor following his unexpected death in 1924. In September 1924, she accompanied him on a tour of the state to promote his plan to introduce a proposal for constitutional amendment for a mineral severance tax. Following his well-received speech in Laramie on the 23rd, William came down with what he thought was a bad case of indigestion. By the time a doctor was called the next evening, his appendix had ruptured and there was little the specialists from Denver could do once the sepsis set in. William hung on until October 2, with Nellie at his side as often as the doctors would allow. Nellie was devastated by the loss. William was buried in the family plot in Cheyenne on the 4th. 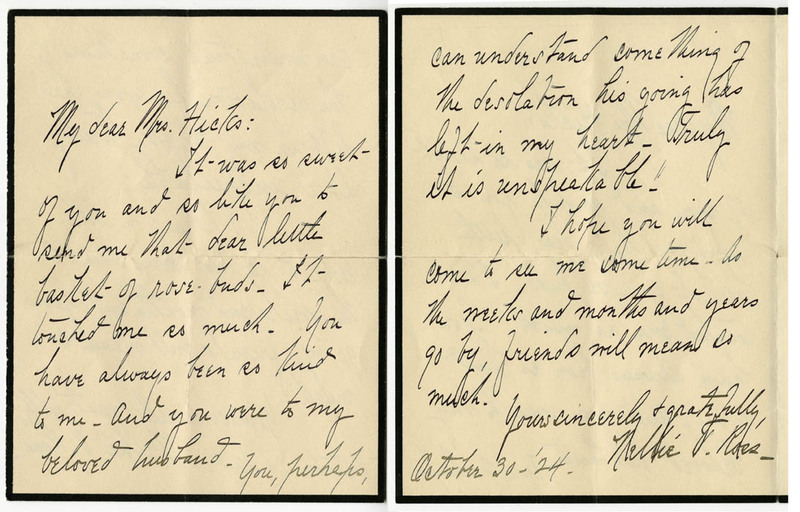 Following his funeral, chairman of the Wyoming Democratic Committee Dr. J.R. Hylton, called on Nellie to offer his sympathies and a novel opportunity. How would she like to run for governor to serve out her husband’s term? Almost as soon as Frank Lucas took over as acting governor, he had called for a special election for governor as statue mandated. There was no time to lose since the general election was coming up on November 5. Including the governor’s race would save the state time and money. But that meant that both parties had only one month to produce candidates and organize a campaign. Who better to take up the Democratic platform than Nellie? Nellie’s supporters were quick to point out that it would be an honor for the “Equality State” to be the first to elect a woman as governor. Senator and former Governor, John B. Kendrick endorsed Nellie’s campaign for governor. Despite running as a Democrat, Ross, like her husband before her, made it clear she was her own woman and would not necessarily follow strict party lines. She also made it known that she was of a mind with her late husband and would follow his lead in many areas. Ross had her detractors, though in deference to her recent loss they tended to be more discrete than in most campaigns. 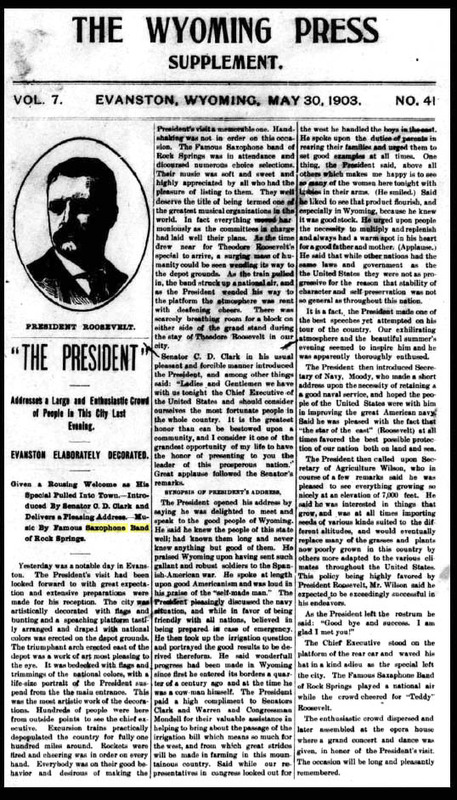 On the eve of the election, Edna Bartlett of Cheyenne published a lengthy political editorial in the newspaper addressing what she saw as the unfounded and wrong assumptions of her fitness for office, and the unfitness of women in general for politics. Edna Bartlett’s methodical, logical response to many of Nellie detractors pointed out what she saw as the flaws in the logic against a woman, and Nellie in particular, serving as governor. On election day, Nellie watched out the window of the Governor’s Mansion as voters filed into the carriage house, a designated local polling place. Her fate was in their hands. Nellie won the governor’s race in 1924 as the only Democratic candidate elected to a statewide office in Wyoming that year. Her win was much less contested than that of MA Ferguson of Texas. In the end, the people of Wyoming elected her by an almost 8,000 vote (55%) majority over E.J. Sullivan. In 1926, she ran for re-election again with a promise of “no pledges except to the people.” She was very narrowly defeated by Frank Emerson. In 1933, she was appointed director of the United States Mint, a position in which she served with distinction as both the first woman and longest-serving (20 years) director. 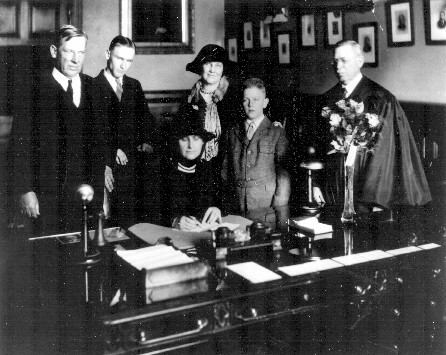 Newly elected Governor Nellie Taylor Ross signs her oath of office in the Governor’s Office, January 5, 1925. 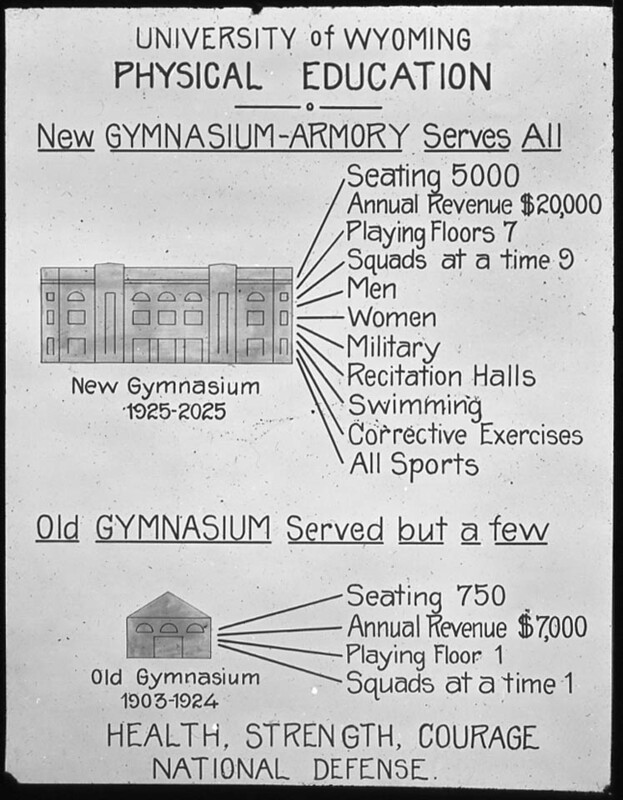 Fliers from Nellie’s unsuccessful re-election campaign of 1926.